Summer doesn’t really top as my favourite season of the year, but one has got to live with it. In the previous years, I may be wrong but fashion was not too evolved with summer vs winter vs monsoon fashion. One would wear denims no matter which month or what temperature it was. The only thing that would change would probably be the easy breezy tops. Ditto for wedding fashion as well. No matter what season, the only thing differentiating the seasons would be the colours worn. But now, things are different and there are so many summer wedding colours to choose from for brides, and sister of the bride/grooms. I have been meaning to write this post for a very long time. So many of you keep texting, and emailing me asking me to give you options for a bride/grooms sister look for the wedding day, I thought let me just put together a post with all the possible options I can think of. Being a sister to the bride or groom is a wonderful thing fashion wise. I say that because you can pretty much get away with any colour which a bride may think twice for. So in case you have a brother or sister getting married in the near future, this post is going to help you decide on what to pick. The thing about whites is that there is so much scope for experimentation. Its a colour that not many brides would pick for their wedding functions, although I do see few brides wearing white. But for a sister of the bride/groom this colour is a hot pick this season. Depending upon the occasion, you can go for an all white ensemble, or a white with a pop of neon, or bright bold colours as well. Nothing says summer better than some summery yellows and greens. If you are looking for day function outfit, these colours are the best ones to go for. The are eye catchy, fun and playful and perfect for that sister of the bride/groom outfit look. The hottest new colour scheme in wedding fashion, you got to love this one. So soothing to the eyes, it makes for the perfect set of summer wedding colours. Whether you’re a bride or a bride/grooms sister, you can’t go wrong with this one. Gold, baby pinks, silver goes best with this colour scheme, and you will see that a lot of bridesmaids and sisters are picking this colour for summer weddings. There are so many variations in pink that brides are opting for these days. Dusty rose is a top favourite for both brides as well as brides and grooms sister. It s a beautiful colour that one can dress up in, looks best when worn in a monotone one shade outfit look. Corals and orange work best with gold. The one name which pops in my mind when I think of orange is Anita Dongre. She has a gorgeous collection which is perfect for a brides sister. 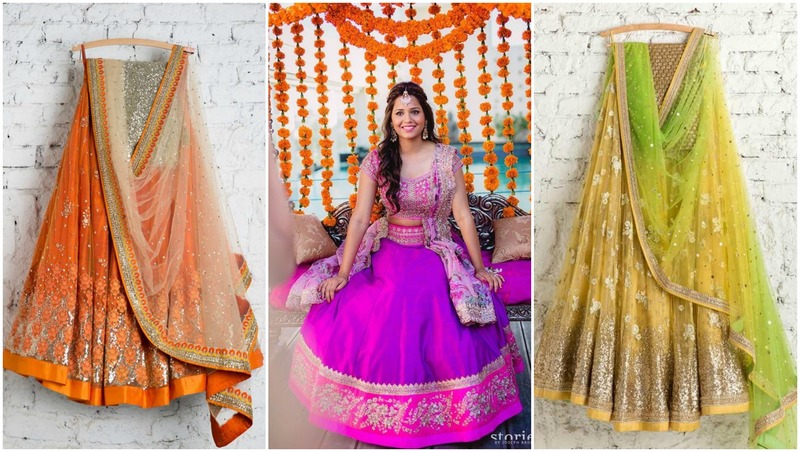 Talking about candy colours, the best designers out there are Priyal Prakash and Anushree Reddy. Both their styles are unique, and quintessentially a sister of the bride style. Some super awesome fun colours, which are off beat and quite quirky, you can totally be the crowd pleaser in this one. Which outfit shade is your favourite from this list?